2. Preheat oven to 425 degrees Fahrenheit. 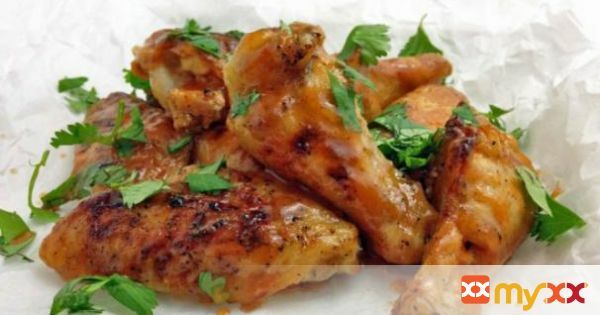 Place chicken on baking sheets ( you will need 2). 3. Add olive oil, salt and pepper to chicken. Toss chicken on baking sheet. 4. Place in a single layer, making sure that no chicken touch. Cook for 10 minutes, then flip and cook for 10 more. 5. Preheat broiler. Take chicken out. 6. Spoon about 1 TBSP of sauce over each wing. Place in oven and cook until turned slightly browned, about 5 minutes. 7. Flip the chicken so that all have skin side up. Pour the rest of the sauce over chicken. 8. Place back in broiler and cook till skin is crispy, about 10 minutes. Once done, toss chicken with sauce created on pan. Serve and garnish with cilantro.